Hiking through the Lake District in Northwestern England, we noticed slate being used for walls, footpaths, houses, and in today's bridge. Actually, slate is an interesting material for an arch bridge. The thin slabs are put face to face into an arch-shape and their self-weight pushes them into compression against the abutments. There was no mortar so the slate is wedged in with the thicker ends on top. No mortar, no spandrels, and no deck: this is a very minimalist bridge. Based on the amount of wear on the top surface, it must be hundreds of years old. 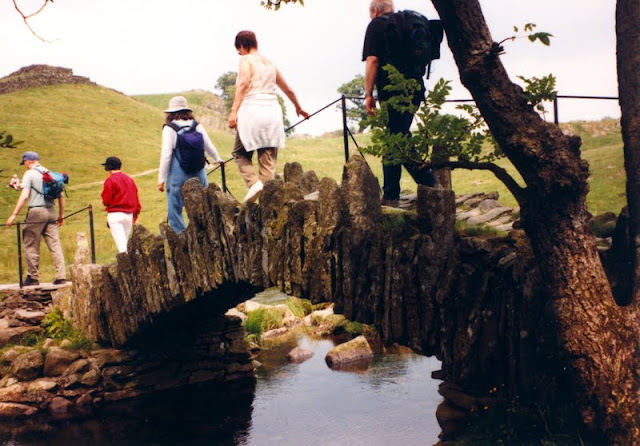 Arch Bridges: Cumbria Pedestrian Bridge by Mark Yashinsky is licensed under a Creative Commons Attribution 3.0 United States License. I've been over this one, although it was in deep snow!